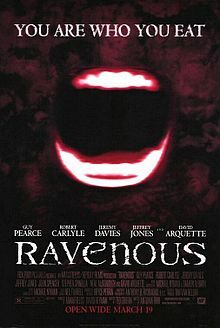 Largely forgotten, Antonia Bird’s underappreciated horror-dramedy is a flawed (she was brought in to replace a director who had chafed under Fox 2000’s heavy-handed management) but gruesomely fun time-killer that may be the best (and possibly only) movie about cannibalism ever directed by a vegetarian. Guy Pearce stars as Captain John Boyd, an Army officer reassigned to a remote outpost after being disgraced in battle during the Mexican-American War (1846-48). It’s the typical dead-end station, populated by screw-ups (including terminally weird Jeremy Davies, perennially spastic David Arquette, and creepy-eyed Neal McDonough) and overseen by a milquetoast commanding officer (Jeffrey Jones). The situation takes a curious (and quickly grotesque) turn when a half-dead guide named Colghoun (Robert Carlyle) arrives at the fort with a harrowing tale of escape from a party of snowbound men who had resorted to cannibalism. The soldiers hike to the scene of the incident, only to find that all is not as it seems. Ted Griffin’s script borrows liberally from the notorious true story of Alferd Packer as well as the Wendigo myth, and somehow works in a little commentary regarding Manifest Destiny (itself arguably a form of cannibalism). Bird manages to keep the material suspenseful while making it more digestible (pun intended) with well-timed servings of black humor, and Michael Nyman and Damon Albarn’s trippy, twangy score adds to the bizarre atmosphere. It’s a taut story with a fair dose of Grand Guignol and top-notch cast that makes for a (ahem) deliciously warped experience. A scene that has Davies screaming “He was licking me!” is enough to make it worth renting.